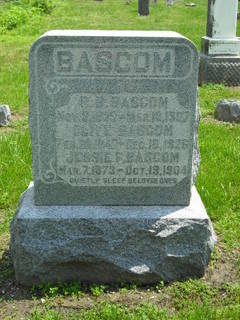 Olive was the second wife of Robert Bruce Bascom. She was born in Ohio County, Indiana to Isaac C. Bovard and Ursula Shepherd. Olive lived in Ohio County all of her life and had nine children with Robert. This entry was posted in Ohio County, Switzerland County and tagged Bascom, Bovard, Cochran, Conner, Dennis, Kittle, Miller, Potter, Sanders, Shepherd, Tyler, Vanosdal on July 16, 2014 by oahblog.